'Jewel in the Palace' was the first Korean drama series I've seen in 2009, followed with Jumong. One of my favorites that time was Queen Seondeok with lead actress Go Hyun-jung. Every episode just gets more exciting, you would want to finish it. Then came 'The Coffee Prince' lead by my one of my favorite Korean actor Gong Yoo. The most recent Kdrama I saw was Goblin. Watching K Drama Fever inspired me to use Korean skin care to achieve younger-looking skin, but it was only a few years ago when I started. When I noticed how effective Kbeauty products, I get rid of my old makeup. Now, I even recommend them to my friends. Recently, another skin care line from Korea arrived in Manila and made available through Watsons Philippines. 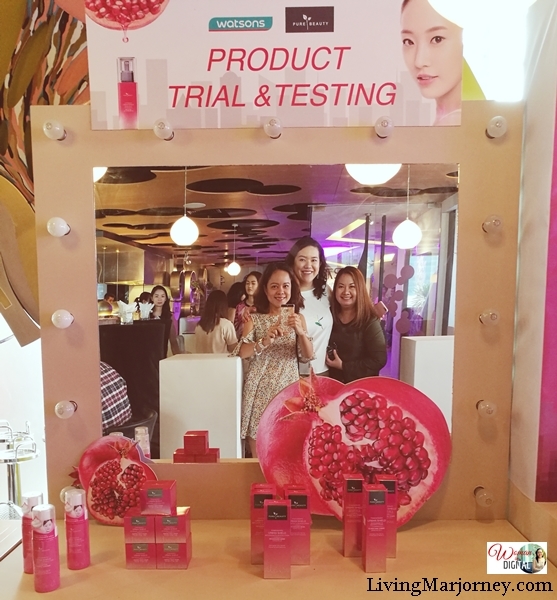 Pure Beauty Pomegranate Urban Shield was officially launched the other day at Vask Modern Tapas restaurant in BGC. Pomegranate has an anti-ageing properties, thus rejuvenating your skin both internally and externally. The juice or extract works on damaged due to sun exposure or aging. While the oil from pomegranate seeds works on strengthening the epidermis and delaying wrinkles. Pure Beauty Pomegranate Urban Shield offers an 8-steps skin care line that promises to nourish and protect skin from inside out. This product is specially created to protect our skin from harmful pollution and stress. Pure Beauty Urban Shield has fermented pomegranate & other fruit extracts that works three levels of protection. Phyto-Placenta, works on skin rejuvenation and as an anti-wrinkle. Pure Beauty Urban Shield is composed of an 8-steps skin care line that promises to nourish and protect skin from inside out. You might think that's a lot but hey, do you really want to achieve that Korean beauty skin just like your favorite Korean actor/actress? The step-by-step skin care regimen by Pure Beauty is not something new. There's no shortcut to achieve that younger looking skin we've ever wanted. 1. 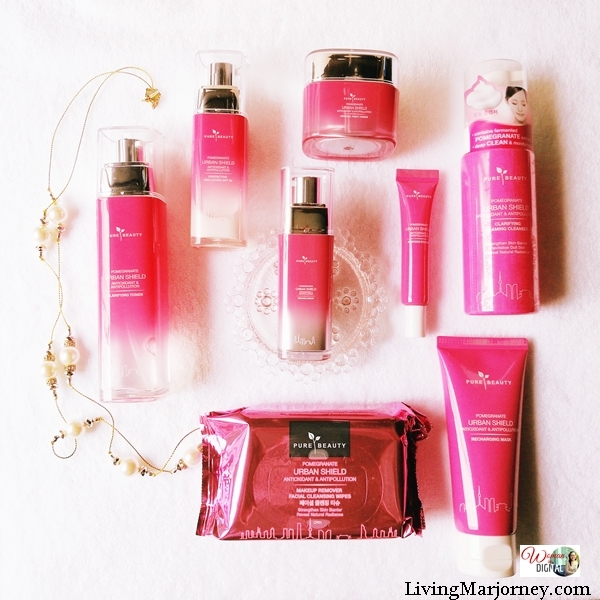 Remove your makeup with Pure Beauty Urban Shield Pomegranate Facial wipes. 5. Don't forget the eye area. Gently apply Pure Beauty Urban Shield Pomegranate Eye Cream. 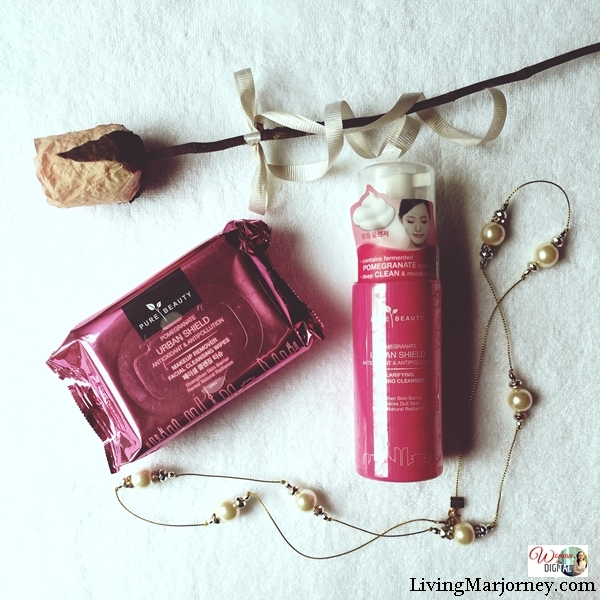 I'm glad that this Pure Beauty Urban Shield Pomegranate Facial Foam comes in a pump. It's so hygienic and convenient. You get the right amount you need with just a few pumps. The facial foam has very mild scent. It does not make my skin tight or dry every after wash. Pure Beauty Urban Shield Pomegranate Night Cream comes in a pretty pocket size jar so it's easy to carry when traveling. The night cream also has a very mild scent. I applied a few dots on my face and gently spread it all over. It's non-greasy but it perfectly moisturizes my skin. I still feel my face hydrated the next morning. I love that every bottle of Pure Beauty Urban Shield comes with a pump. 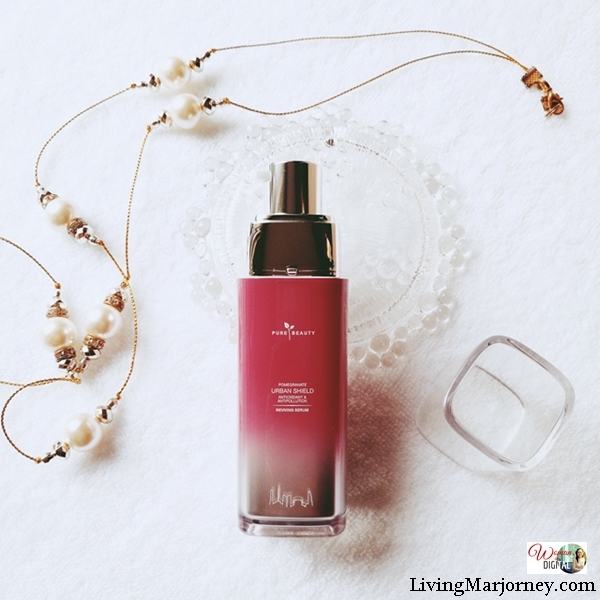 With 2-3 pumps of Pomegranate Serum my skin gets an intense hydration. It has a clear, unscented semi-liquid formula which promises immediate and long-lasting intensive treatment. I feel my skin rejuvenated the next day. It's soft and supple. 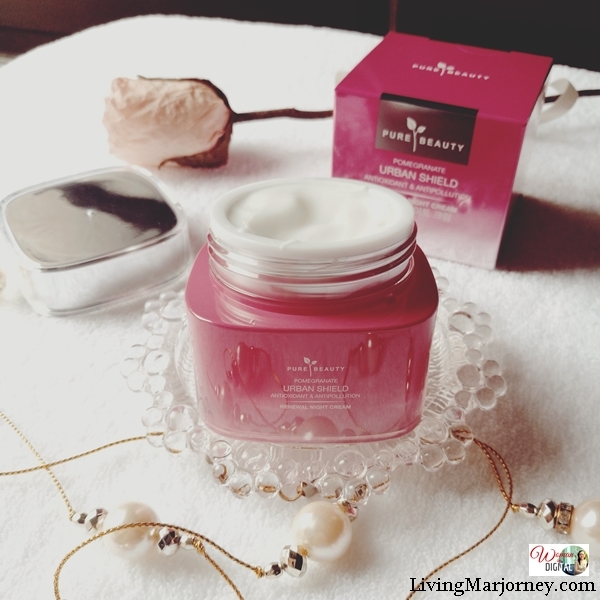 I've been using Pure Beauty Urban Shield Pomegranate Skin Care line for a week now. I'm happy how it makes my skin perfectly moisturized. The day cream also works as a sunblock protecting my skin from UV rays and harmful pollution. 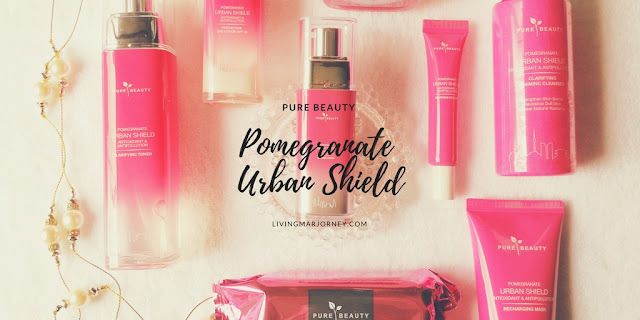 Pure Beauty Pomegranate Urban Shield is now available at all Watsons nationwide. You can get the complete set but each item is also being sold separately. 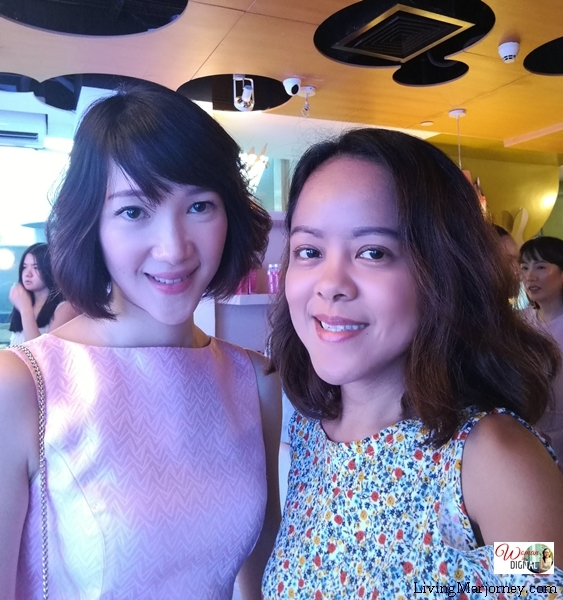 Do you have Korean skin care tips you'd like to share? What Korean makeup brand are you using?